Pope Francis wrapped up a brief but deeply symbolic visit to Egypt on Saturday with an open-air Mass for the country's tiny Catholic community, defying security concerns to show his support for the Christians of this Muslim majority Arab nation who have increasingly become targeted by Islamic militants. Military helicopters flew overhead and police fanned out in force as Francis zoomed around the soccer stadium in suburban Cairo where Mass was held, using an open-topped golf cart and waving to members of the congregation, evidence of his hallmark desire to be close to his flock at all costs. The crowd cheered him wildly, waving Egyptian and Holy See flags and swaying to hymns sung by church choirs. The military-run stadium has a capacity of 25,000, but only about 15,000 people attended — a reflection that Catholics represent less than 1 percent of Egypt's 92 million people. But the relatively modest number and the draconian security did not dampen their jubilant mood. Francis engaged the crowd with waves and smiles, and gave his blessings to the children hoisted up by their parents. 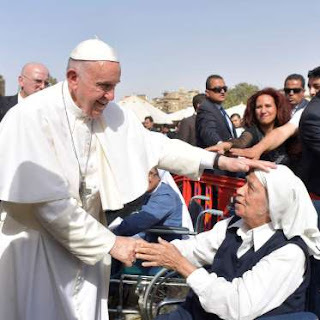 In his homily, Francis urged them to be good and merciful to their fellow Egyptians, saying "the only fanaticism believers can have is that of charity!" "Any other fanaticism does not come from God and is not pleasing to him!" he said. It was a very pastoral message after Francis on his first day demanded that Muslim leaders renounce religious fanaticism that leads to violence. Francis made the appeal during a landmark visit to Cairo's Al-Azhar, the revered 1,000-year-old seat of Sunni Islam learning that trains clerics and scholars from around the world. But Francis decided to forego the bullet-proof "popemobile" his predecessors used on foreign trips and drove through Cairo in a simple Fiat, his window rolled down. "He is a messenger of peace, he is really a messenger of peace," said attendee Amgad Eskandar before the Mass began at the stadium. "All his words talk about peace, call for peace, push for peace, which is great." The pope's gestures — the simple Fiat and the open-topped Golf cart — sent a defiant message to the extremist Islamic State group, whose local affiliate in Egypt has vowed to target Egypt's Christians to punish them for their support of President Abdel-Fattah el-Sissi. As defense minister in 2013, El-Sissi led the military's ouster of the Islamist Mohammed Morsi, Egypt's first freely-elected president whose one-year rule proved divisive. El-Sissi was elected president a year later and is widely expected to run for a second, four-year term in office in June 2018. IS claimed responsibility for the three attacks, carried out by suicide bombers, as well as one earlier this month that targeted a police checkpoint near the famed Saint Catherine's monastery in central Sinai that killed a policeman. Francis strongly backed the government's crackdown on the extremists Friday, saying Egypt was uniquely placed to bring peace to the region and "vanquish all violence and terrorism." El-Sissi has since 2013 overseen a major crackdown against Islamists, jailing thousands along with hundreds of the activists behind the 2011 uprising that toppled autocrat Hosni Mubarak. El-Sissi's security forces, meanwhile, have been fighting in the Sinai Peninsula to put down an insurgency by militants led by the local IS affiliate. The militants have occasionally struck in mainland Egypt, targeting military and police personnel as well as government officials. El-Sissi has vowed to crush the militants while urging Muslim clerics to modernize Islam's religious discourse to stifle the culture of hatred for non-Muslims and the West embraced by jihadist militants. Francis also paid tribute to the victims of the December bombing at central Cairo's St. Peter's church, which is located in close proximity to the St. Mark's cathedral, the seat of the Coptic Orthodox Church. Blood on one of the church walls remains unwashed and is adorned by pictures of the 30, mostly women, victims of that attack. His visit drew praise from Egyptian Catholics, who haven't seen a pope in their land since St. John Paul II visited in 2000. "I think he is a man of peace and I think he will be like John Paul II, he will be a saint," said Mariam Fayek from the stadium grounds. "Although there are many reasons to be discouraged, amid many prophets of destruction and condemnation, and so many negative and despairing voices, may you be a positive force."